The loft has been pre installed with electrical, windows and plumbing prepared to be converted in to another large bedroom with en-suite. Separate garage annex perfect for storage or to convert in to another flat. 2 wells, connected to the main sewage system. This property was built as a family holiday home in the countryside back in the 90’s when it was built in 1995, they’ve planned to gradually increase the living space, so they left the loft prepared to be converted as a large en-suite bedroom as well as the annex which is big enough to be a one bedroom flat and build a car port outside. The location is very well connected there’s the express bus from Cabaços a village nearby at 20 minutes walk that goes to Lisbon twice a day. There’s a double iron gate from the road, which leads on to the house. The main entrance leads to the open plan kitchen/reception room, from this room there’s access to the bathroom and the bedroom, as well as on the left to the lounge. In between the reception room and the bathroom, there’s a large loft hatch, which could be converted into a staircase leading up to a potential large en suite bedroom in the loft area. The garage is approximately 50sqm which would be perfect to convert into further living space, if required. 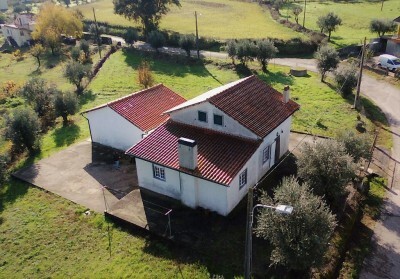 The property is located on the edge of the quiet village of Aveleira which is at similar distance from the Market towns of Alvaiázere and Cabaços. The municipality town of Alvaiázere is 2.5km distance where you can find a registry office, notary services, banks, supermarkets, schools, public swimming pool parks, cafés en restaurants, etc.